*The bulk of information seen here was provided to me by the Tigerlily Foundation. Tigerlily Foundation's Young Women's Breast Health Day on the Hill was first held in 2009, in response to creating additional advocacy and awareness about the issues young breast cancer survivors faced. The Young Women's Breast Health Day was launched after Representative Debbie Wasserman Schultz signed into law the Breast Cancer Education and Awareness Requires Learning Young(EARLY) Act in 2010, which created an education and outreach campaign administered by the U.S. Centers for Disease Control and Prevention(CDC) to highlight the breast cancer risks facing young women and women of higher-risk ethnic and racial backgrounds, while empowering them with the tools they need to fight the disease. Join us in our nation's capital on June 17th from Noon to 2:00 pm for the Tigerlily Foundation's 4th Annual Young Women's Breast Health Day on the Hill. Be involved and informed about organizations that are impacting the lives of young breast cancer survivors. This event will take place at the Rayburn House Office Building, Room B-338 on 45 Independence Avenue, SW, Washington D.C. For additional information and to register please visit Tigerlily Foundation's event website. They encourage and welcome young breast cancer survivors(YBCS) to attend, connect, and meet other survivors. This important event for breast cancer issues will bring together members of congress and congressional staff as well as policymakers, corporate healthcare entities, advocacy and health care organizations to raise proper awareness about specific issues facing young women with breast cancer. This committee will also feature speakers who will discuss their efforts of outreach to the young breast cancer community as they provide education and awareness. They will be highlighting the efforts of those YBCS at high risk and also facing disparities. Tigerlily Foundation's main goal is to further engage the members of the healthcare community and stake holders in the work being done for YBCS and to create additional collaborations, partnerships, as well as opportunities to reach more young women, healthcare providers, and to provide the general community with vital information. Do you know someone with breast cancer? Do you know someone close to you that has died as a result? I can guess your answer to both of these questions is probably "yes". We have all been affected by breast cancer. Get involved and understand what is happening right now! Get ready to understand how the policy makers of today are going to shape the future of young breast cancer survivors tomorrow. Together we are powerful. One person CAN start a movement. 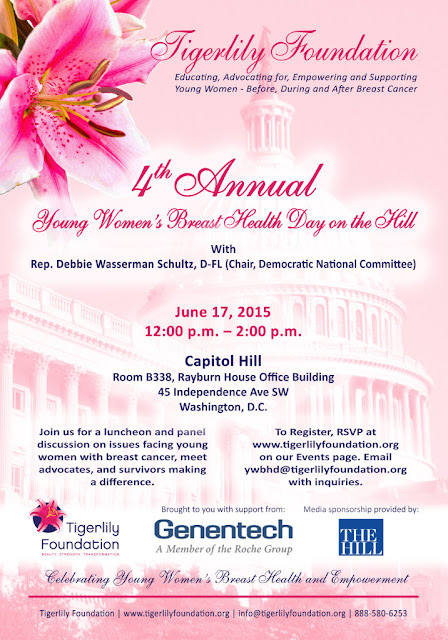 Register for the 4th Annual Young Women's Breast Health Day on the Hill today. 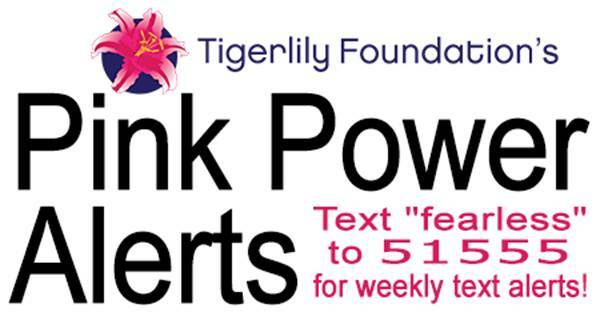 This is a paid AD for Tigerlily Foundation by Virginia Bloggers Club, LLC.